Most movies out there exist to hold the audience's attention from the beginning to the end credits, possessing dramatic buildup or comedic twists and turns that create a consistent level of engagement throughout. Then, there are films whose sole purpose hinges on a specific scene -- or succession of scenes -- after all the groundwork has been laid, where the events that happen prior to these pivotal moments are just moving parts required to lead a specific cinematic idea to its purpose. Such is often the case for thrillers or mysteries that revolve around a specific plot twist, but not so much for comedies, building toward one specific lampoon or punchline. Sacha Guitry's dark, measured comedy La Poison largely operates in this fashion, where the events leading up to the "big show" near its end merely function as dryly humorous devices that ultimately funnel into an elegant, compelling twist on the courtroom drama, a slyly lighthearted yet entirely cynical takedown of marital woes and manipulations of the law. 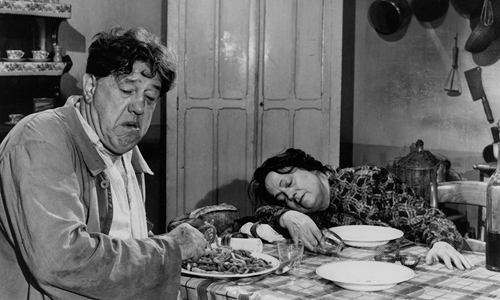 After a lengthy introduction to the cast and crew at the film's beginning, led by director Sacha Guitry and entirely separate from the story at hand, La Poison depicts the everyday happenings of a small and sleepy French village. People make their way to and from the pharmacy, locals set up camp at the café, and folks like Paul Bracconier (Michel Simon), a gardener by trade, swing by the local church to chat with the priest and divulge their "sins". The root of Paul's frustration hinges on his wife (Germaine Reuver), whose bitter attitude toward her husband is made worse by her persistent drinking and general lack of attention paid to her appearance (and cleanliness). In a fit of frustration, disguised as regular irritation between spouses, Paul contemplates a life without his wife … if she were to die. Little does he know that she, too, contemplates the same thing. With the resources available to them in the small town and driven by the sounds of a particularly contentious radio broadcast involving a lawyer who's had great success in defending murderers, the married couple inch closer to making their fantasies a reality. 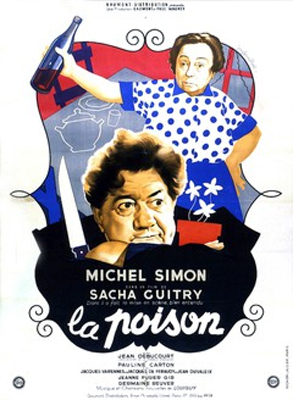 While depicting the early frustrations of the Bracconiers and the personalities of the other townsfolk, director Guitry establishes a playful, yet not overtly comedic tone with La Poison. Between an older woman reading over the pharmacist's prescription ledger to see who's taking what for their ailments, reaffirming her suspicions, and the casual chatter about potentially lethal marital frustration between Paul and the local priest, the conversations toe the line between attempts at joviality and highly deliberate stage-setting for the events to come. Emphasis falls on the chilly, quarrelsome rapport between the Bracconiers over their nightly dinner routine, though they probably consume more calories through the bottle(s) of wine they drink than the brothy soup and loaf of bread at their table. There isn't much joy derived from observing their bouts, nor from the ways in which the townsfolk become voyeurs and sleuths to their verbal arguments, but there's something pleasurable in seeing how Guitry creates the foundation for the escalation in their bickering and emphasizes potential murder methods. In fact, it's hard to imagine La Poison being interpreted as an exercise in humor without the presence of Michel Simon. With a body of work stretching from the seminal silent masterpiece The Passion of Joan of Arc to eccentric performances in Boudu Saved From Drowning and L'Atlante, among many others, Simon's sympathetic and subtly oafish demeanor as Paul taps into mild physical comedy. His body language speaks volumes about the character's mental faculties as he converses with the clergy and evades his tiring wife, appearing just uninviting and rough-around-the-edges enough to miss out on the attention of women yet just charmingly browbeaten enough to tempt one's sympathy. Simon's manner of speaking leaves his character's capacity for murder in an uncertain state, perhaps in flux as he copes with the exaggeratedly stern-faced attitude of his wife. Their hostile interactions possess a bit of a "means to an end" rhythm, wherein Guitry doesn't reveal any interest in examining who they once were as a couple that found each other appealing enough to get married, only in Paul's internal conflict now. For better or for worse, everything holds a purpose in La Poison that isn't centered on deepening the characters or garnering laughs, a purpose that gradually becomes clear once the focus shifts to lawyers, the legal system, and crossing the threshold from anger to murder. Guitry draws from his own complicated experiences with dealing with the law -- he coped with charges of collaborationism during the Nazi occupancy of France in the ‘40s -- in his incredibly clever depiction of the malleability of circumstances surrounding a criminal activity, notably in the orchestration of the perfect crime by way of some unknowing advice from a lawyer. While the situation comes across as contrived and purposely evasive of the audience's viewpoint for dramatic effect, the ways in which a potential murderer exploits the viewpoints of lawyers in how to beat the system gradually allows that darkly comedic sinking feeling to settle into the stomach. Through the chaos of a crime scene and the ensuing trial, La Poison builds into an outlandish, yet biting and perceptive satire that travels down a troubling -- and timeless -- road with its justifications of murder and defending those whom have murdered. Guitry executes plenty of cleverness in how he channels all the minutiae of the film's prior events into a raucous courtroom discussion, cutely juxtaposed against scenes of children acting out how their vision of the trial should've gone and how hearsay about a crime travels throughout a small town. There's some oddities during the final act, especially when the topic of attractiveness of people emerges during a trial as a talking point relevant to guilt or innocence, but La Poison ultimately applies a strong dose of sharp, amusing commentary to how the discombobulated tiffs of an old married couple drive them to murderous tendencies, justifying the transparent maneuverings that Guitry had to set in motion to get beyond that point.